Princess Clara thought she knew the main threat to her freedom. She was wrong. At seventeen years old, Clara isn’t ready to marry, and yet that’s what she must do as the crown princess of Austria. 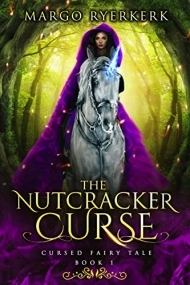 However, getting to know the foreign princes visiting her kingdom becomes the least of Clara’s worries when she picks up a bespelled nutcracker and unleashes a deadly curse. She has twelve days to find and feed the nutcracker the magical nut Crackatook. If she fails, her soul will be trapped inside the toy for all eternity and her body will turn to wood. Instead of relying on her suitors or the king’s men to find the cure, Clara saddles her unicorn and sneaks out of the palace. Her childhood friend Philip notices her leaving and makes her choose between returning to the castle or allowing him to come along. Reluctantly, Clara agrees to him joining her, and soon, they are off to lands filled with mythical creatures. Will they survive all trials and find the Crackatook in time? Or will Clara’s soul become trapped in the nutcracker and her body turn to wood? Filled with adventure, love, magic, and a strong heroine, this clean YA Fairy Tale is the perfect festive read! If you like K.M Shea, Melanie Cellier, and Kiera Cass, you’ll love this! Clara is the princess and has a duty to meet with suitors to find a husband. But when a curse falls upon her after touching a nutcracker, she has to retrieve a special nut to save herself. If she fails, she will become a nutcracker. Her father gives the task to the princes, but Clara doesn’t wanted her fate resting in their spoiled hands. Griselda used to be Clara’s stepsister, but she’s banished when the king discovers she can transform into a mouse. Griselda wants revenge against Clara for betraying her, so she sets up the nutcracker curse. Then, she can become queen in memory of her mom. As the days tick by, Clara is happy to have her best friend Phillip at her side to assist her on her quest but fears they won’t make it in time. They meet all types of magical creatures and must get through all of the realms to find the nut. Final Verdict: Told in alternating POV between Clara and Griselda, THE NUTCRACKER CURSE is full of magic and is a breath of fresh air. I would recommend this to fans of The Nutcracker, fantasy, strong princesses, magic, and curses. The Nutcracker Curse is the first book in my Cursed Fairy Tale series. Each book is inspired by a classical fairy tale.